If you have any interaction with the public at all, you’ve probably noticed that there are a lot of sickly people out there right now. Half my Facebook feed consists of folks who are whinging about their sore throats, hacking coughs, and other less-than-fun symptoms, and chances are that any store you step into will have at least one nose-blowing, wheezing sad sack wandering about. We can try to prevent ourselves from getting sick by eating well, getting enough rest, and washing our hands, but if and when the cold gremlins win out, it’s good to have some soothing home remedies at hand. Horehound has been used medicinally since the Roman era and with good cause: this merry little member of the mint family works wonders for all kinds of respiratory issues. I love horehound lozenges for bronchitis and bad colds when I end up with a gross, phlegmmy, hacking cough, and they’re also great for soothing raw throats (which usually end up sore from coughing so much). Just one note: horehound is rather bitter, so these aren’t the most ideal for kids. If you don’t like bitter flavours, or you’re making these primarily for children, ditch the horehound and use 1/4 cup of slippery elm powder, or else a mixture of the two herbs. Pour the dried leaves and water into a small sauce pot, raise the heat to medium-high, and just as it starts to bubble, turn the heat back down to a simmer. Let this simmer for 2-3 minutes or so, then remove the pot from the heat, cover it, and let it steep for another 15 minutes. Place a double layer of cheesecloth over your strainer or colander, and strain the mixture through it. Squeeze the cheesecloth to get all the moisture out, and compost the wet leaves. Then, pour the strained liquid back into the pot, add the honey, and bring the mixture back up to a boil on medium-high heat. If you have a candy thermometer, you’ll want to simmer this mixture until it reaches 300F, or use the ice water test. 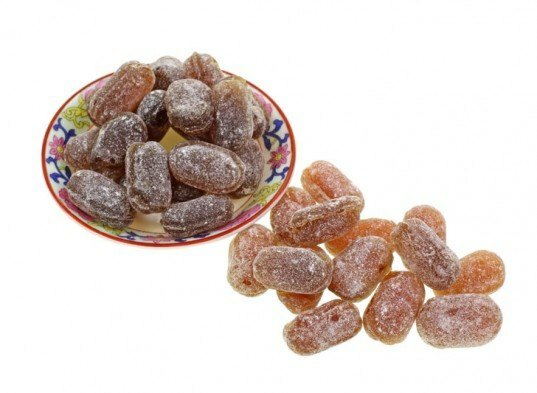 I don’t have a thermometer, so the test I use is to pour a few drops of the mixture into a bowl of ice water: if the drops harden to the consistency of a candy cough drop, the mixture is ready; if they remain sticky and malleable, you’ll need to boil it down a bit more. Once your mixture has attained the right temperature/consistency, it’s time to make the lozenges. There are two ways to go about this: you can either grease up the sheet, let the mixture cool slightly, and then break bits off to form into small balls in your hands, or you can pour down a layer of powdered sugar or sweet rice flour, use your thumb (or a thimble) to press hollows into the powder as moulds, and then pour spoonfuls of horehound mixture into those hollows. I prefer the latter method, and using sweet rice flour or cornstarch cuts down on the sugar content. Although the flour/powdered sugar should keep the lozenges from sticking together during storage, I’d recommend wrapping each one in waxed paper just to make sure. Keep them in a jar in the fridge until needed. Sore throats aren’t fun to contend with, but the combination of ginger, lemon, and honey can work absolute wonders for alleviating the pain and scratchiness. You can also make these into lollipops by inserting sticks (found at any baking supply shop) into the lozenges before they cool. Simmer your ginger in the water for a few minutes to infuse it a bit. Pour the dried marshmallow root into a pot or bowl and strain the warmed, gingery liquid over the dry herbs. Let that sit for an hour or so, and then strain it through cheesecloth. Marshmallow is a demulcent herb, and as such is really soothing to sore, raw throats. 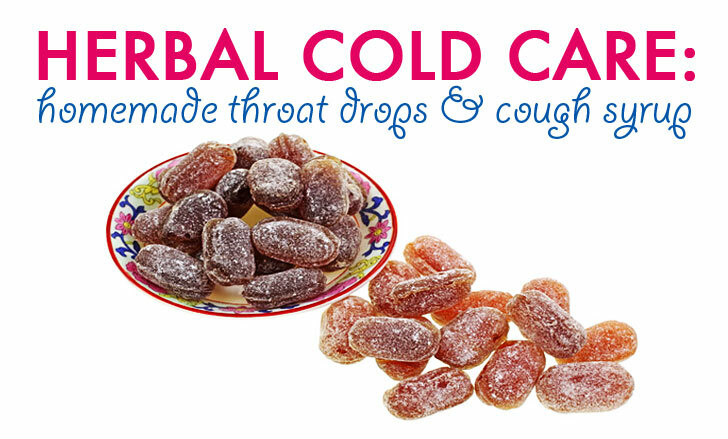 To create your lozenges, follow the same instructions as listed for the horehound drops above. This recipe will make about 15 lozenges, but I’ve found that it’s easier to make a few smaller batches than one large one, as you have to work quickly to pour the viscous mixture into the molds. Using a baster can help, as you’re huffing the liquid up into the canister and can then release as little or as much as you like into each mold depression. 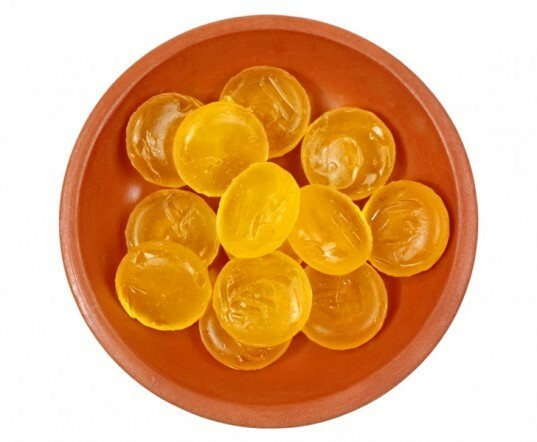 Wrap and store these lozenges as described for the horehound ones. Now, there are many different kinds of coughs out there. There’s the wet, congested cough that seems to bubble up from the depths of your lungs; there’s the dry, hacking cough that feels like it’s stemming from the base of your throat, and all manner of coughs in between. There are several different herbs that can work in combination for a variety of coughs, but mullein is an all-around great one to have on hand to bring relief, especially if your cough is keeping you up at night. Simmer the mullein in water on low heat for 15-20 minutes, then strain well. Pour the strained infusion back into your saucepan and keep simmering until it has reduced to 1 cup. Remove from heat, and add 1/2 cup of the honey, stirring gently until it’s dissolved. You may have to place it back on a warm burner for a moment to heat it enough for the honey to dissolve, but don’t boil it! You’ll kill the healing properties in the raw honey if you do. 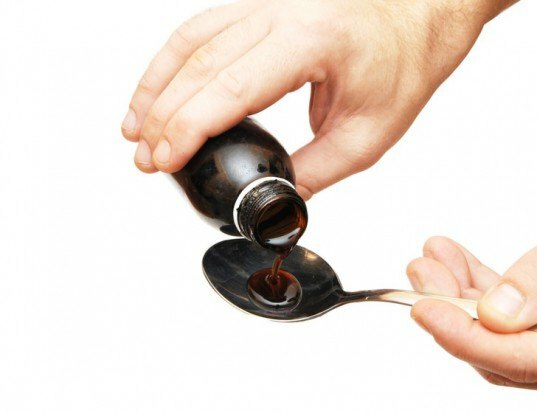 If you find that the syrup isn’t thick or sweet enough, keep adding a tablespoon at a time until it tastes right to you. Once all the honey is dissolved, allow it to cool to room temperature, and then add the brandy, if desired. Take a teaspoon as needed. As always, do plenty of research before administering any herbal remedies, and talk to your health care provider if you’re taking any other medications, just in case of contraindications. If you have any interaction with the public at all, you've probably noticed that there are a lot of sickly people out there right now. Half my Facebook feed consists of folks who are whinging about their sore throats, hacking coughs, and other less-than-fun symptoms, and chances are that any store you step into will have at least one nose-blowing, wheezing sad sack wandering about. We can try to prevent ourselves from getting sick by eating well, getting enough rest, and washing our hands, but if and when the cold gremlins win out, it's good to have some soothing home remedies at hand.